Margaret River's premier forest retreat offers unparalleled privacy and seclusion. Delight in the captivating views of the forest from your fresh water spa set in it's own sauna style room. 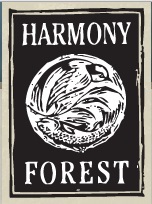 Try our fantastic Private Select Merlot which is drinking beautifully in 2012, and available only to guests of Harmony Forest. Complimentary spa bubbles, toiletries and welcome chocolates to spoil you. Electric blankets and potbelly stove to keep you cosy in winter, inbuilt dvd player and cd/ipod dock plus much more is provided. Marsupials and brilliant birdlife abound in our genuine karri forest setting. Amble through our vineyard or treat yourself to an invigorating forest walk as the perfect complement to the indulgent pampering of your bubbling spa. Secluded cottages with a nice big spa. You feel like you are in the middle of a forest with no neighbors. Great spot to get away from the rat race for a while. From Perth take the Kwinana Freeway South (Highway 2) which becomes Forrest Highway and continue onto Bunbury, then take Highway 10 to our Harmony Forest sign, 16 kilometres past and south of Margaret River.